Click here to see how we use 3D CAD modelling software to develop our products. Brightworks has close links with manufacturers in Europe and the Far East that provide cost effective production solutions. The Ecoegg laundry egg is a device specifically designed to replace traditional washing powders and liquids with a more ecological cleaning method that is still as effective at removing dirt and stains from clothes. This helps save money for consumers and is much better for the environment. 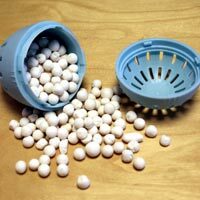 The egg is filled with scientifically formulated hypoallergenic cleaning pellets when it is first used. These pellets naturally activate in water to gently lift away dirt and grime, without using any harsh chemicals, and provide a natural softening effect. The egg is then simply placed in with the washing each time and will remain active for up to 720 washes. Brightworks' team of designers made use of extensive market research supplied by our client to develop several initial concept design options for the device. The look and feel of the product was hugely important, together with ease of use, durability and perceived quality. Following an extremely aggressive timeline, Brightworks developed a 2-shot injection moulded solution with a simple bayonet fit connection between the 2 halves of the egg, making the product extremely quick and easy to use. Our in-house engineering team worked closely with our client’s Far East manufacturing partner to agree the final detail of the components and to help select the production material. Ecoegg carried out extensive market testing to ensure proper function of the product using pre-production samples prior to full market launch. The product has sold over 100,000 units since its initial launch, having had particular success on home shopping channels - in one day selling over 23,000 units. More recently Ecoegg have moved full scale production of the Laundry Egg back to the UK and were winners of the Smarta 100 Special Award for Innovation in 2012.